Hi everyone! It's a happy day here at SprinkledWithGlitter.com! It's time for the Essentials By Ellen Holiday II Blog Hop. There are some fabulous new products for your holiday crafting. And...even though they're labeled holiday, some of the products can be used year round. These products are available exclusively at EllenHutson.com. In honor of this fun and exciting day, I'm sharing TWO video tutorials with you. I'll have those, as well as links to the products used in these projects below. There's lots of crafty goodness to share, so let's get to it! The Tis The Season stamp set is not new this year, but the coordinating dies are. Coordinating dies allow you to stretch your stamps even further and make cards with fun techniques like partial die cutting and make masking easy. Here's some projects I've made using these stamps and dies together. I LOVE the cute car. I've made two projects with these adorable cars. I stamped both cars on some Smooth Bristol card stock and colored them with my Zig Clean Color markers. I then added some fun details to the cars, including some glossy accents over the windows and some Sparkle Puff Embossing Powder for snow. 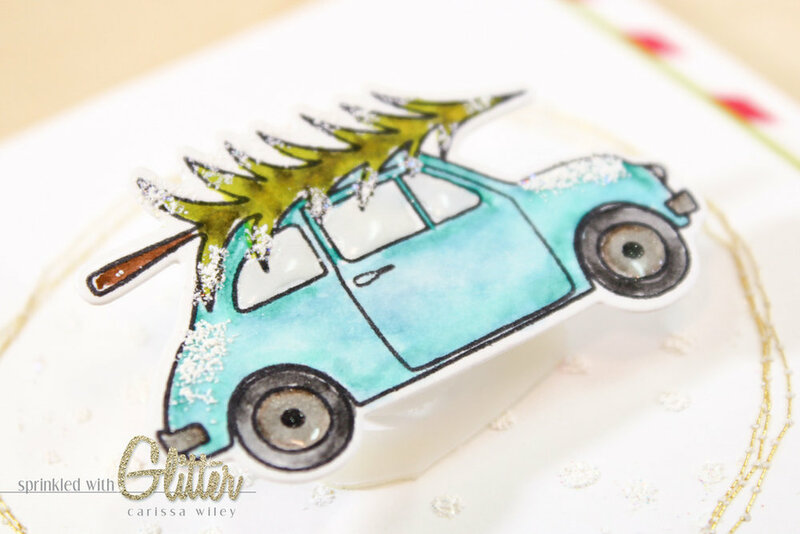 I'll be showing a video tutorial on these cute car projects next week. 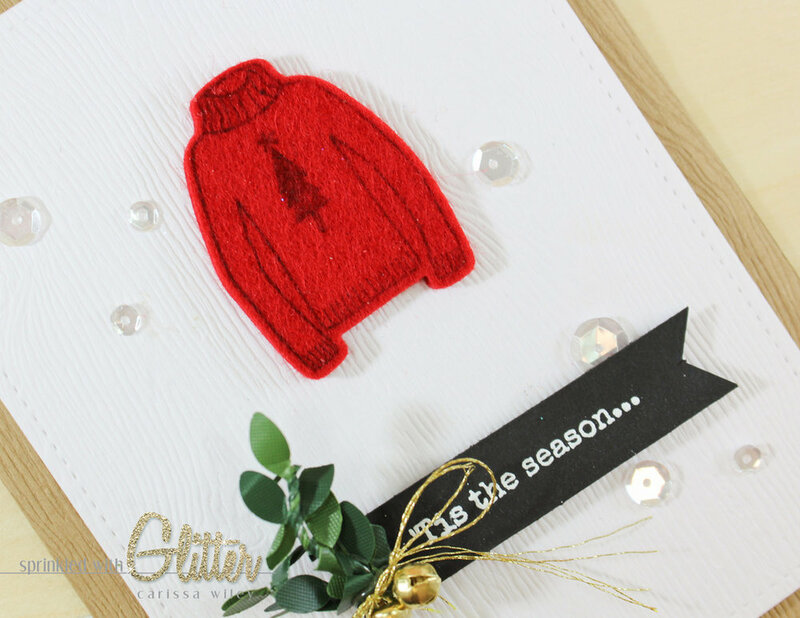 I also used the Tis The Season stamp and dies to create this adorable sweater card. It would make the PERFECT ugly sweater party invitation. I'll show you how I stamped this on some felt and die cut it using the coordinating dies. It's easy and fun! The Holly Jolly stamp set is full of gorgeous brush script sentiments. I had a great time creating cards that allowed these fabulous sentiments to shine. I used some Distress Inks on some Smooth Bristol card stock to create a background for this gorgeous sentiment. I embossed it on some vellum with some Silver Pearl Embossing powder. This has a gorgeous pearly sheen. And I couldn't resist adding a purple bug to this card as well! A few sparkling clear sequins...and voila, a fun winter card! 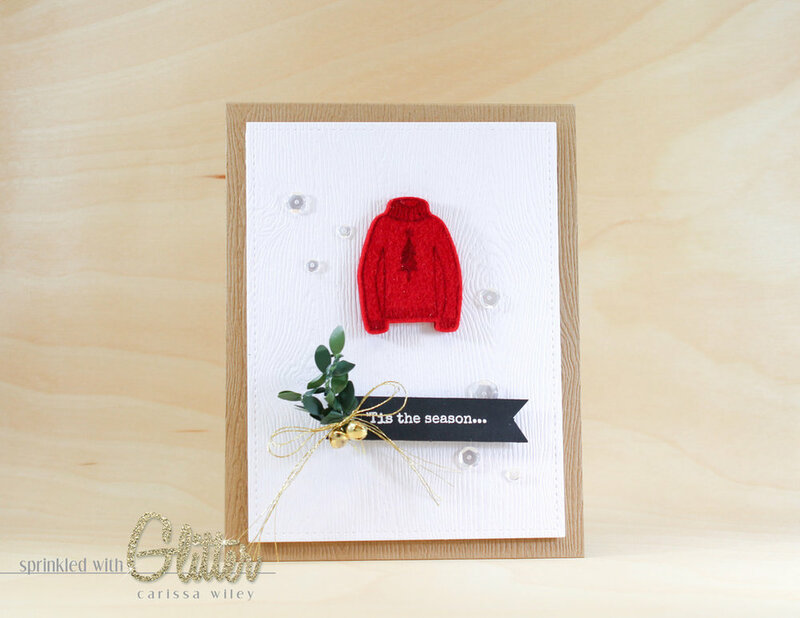 I also used the Holly Jolly stamp set and Poinsettia and Pine Dies to create this Christmas card. This is one of the cards that I created a video tutorial for below. Be sure to check it out. I love the detail that the gold stitching adds to the side of the vellum piece. And I love all the modern patterned papers mixed together. I also love the beautiful holly leaves and other shapes that are a part of the Poinsettia and Pine dies. I used those here to create some bright holly leaves for my card. Once I got started with this release, I really couldn't stop! I had to make one more card using the Advent stamp set and coordinating dies. 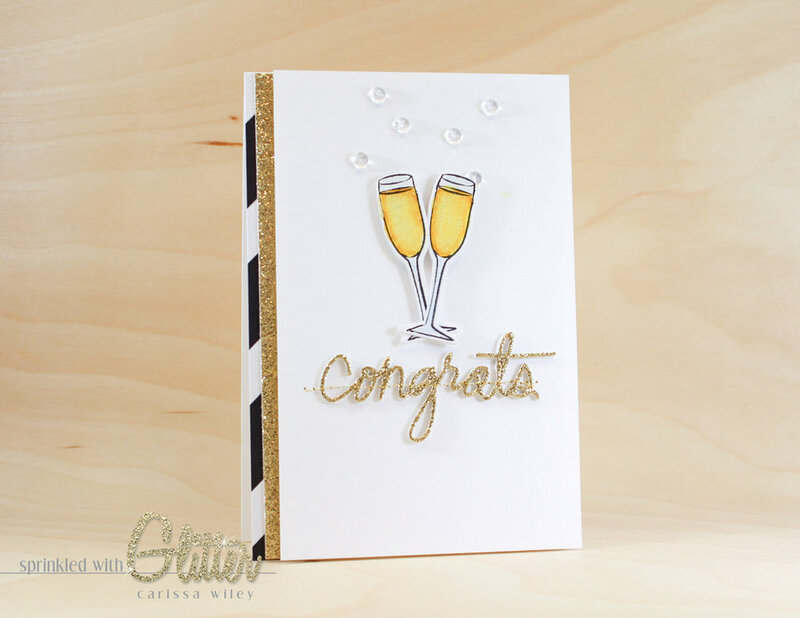 This champagne glass is perfect for celebrations and congratulations year round! I added a gold glitter sentiment from the Zipper Panel die set from the Essentials by Ellen line and some clear droplets from Pretty Pink Posh. Perfect bubbles! I'm so excited to be able to give away one of the fabulous Essentials By Ellen stamp sets (max value $15). You can choose any in stock Essentials By Ellen stamp set if you're the winner! How cool is that? You're going to love it! To enter, you MUST use the Rafflecopter widget below. (Trust me, it's easy.) You must enter by October 27th, 2015. And don't forget to head over to The CLASSroom blog to get details on the grand giveaway....a huge prize pack full of fabulous crafty stamps and dies. The winner will be announce on The CLASSroom blog on Friday, October 30th, 2015. If you're coming from Anna Wight's blog, you're hopping along just fine. The last stop on the hop is The CLASSroom. You can start there to make sure you don't miss any eye candy and crafty inspiration.